KJM Electrical Ltd are widely recognised in Northern Ireland as a leading electrical contracting firm with a highly respected client portfolio. We offer specialist technical resources to the UK Power Supply industry and provide expert electrical maintenance services to multi-site public bodies, local authorities plus the commercial and industrial business sectors. KJM operates a large fleet of service vehicles staffed by full-time approved electrical engineers and experienced jointing teams. 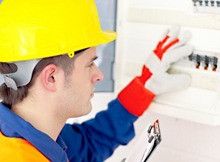 We have been providing specialist electrical services in Northern Ireland for over twenty years. The KJM reputation is distinguished by expertise, dedicated point-of-contact support and reliable rapid-response. Our core focus is the development of sustainable systems and cost-effective maintenance. Working with NIE Networks, KJM Electrical Ltd is responsible for a large proportion of metering services across Northern Ireland. We have established bespoke customer service systems designed to minimise impact on our utility provider’s resources. Our public buildings maintenance contracts are fulfilled by highly experienced electrical engineers. KJM teams are uniformed, security-cleared and trained to work sympathetically within architecturally sensitive environments.